There were two teams without representation on my NL All-Star team: the Padres, and the Giants. For the Padres, I would've selected RP Kirby Yates, and I would've been forced to bump RP Seranthony Dominguez off the team. For the Giants, I would've selected 1B Brandon Belt, and would've had to bump 1B Joey Votto off the team because a) I only have 6 outfielders on the team, which is the minimum, and b) Belt would bring me to five 1B, which would go beyond the limit for the position, so with great hesitation I would've had to bump Votto. I say with great hesitation because Votto is one of the greatest Canadian baseball players I've ever had the pleasure of witnessing, and because I believe Votto-super fan Smasher is currently in Ontario, and I'm sure he would've hunted me down, and had me drawn and quartered on the spot had Votto not made the team. Thankfully, by not adhering to the participation medal rule, I don't have to worry about that grim possibility. Phew! This is a pretty damn good team. The only weak spot really is Francisco Cervelli, the reserve catcher. Belt is probably the only real snub, but as discussed above, he's not really a snub because he would not have made the team due to the incredible strength of the first base position in the National League. 3B Anthony Rendon (WSN), OF Matt Kemp (LAD), and 2B Cesar Hernandez (PHI) were in the just missed category (aside from Belt of course). 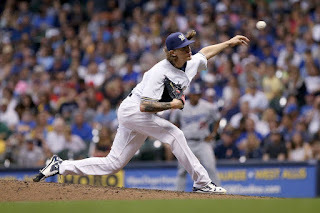 Zack Greinke (ARI), Miles Mikolas (STL), and Mike Foltynewicz (ATL) were in that category amongst starting pitchers, while Jared Hughes (CIN), Kirby Yates (SDP), and Tony Watson (SFG) were the relievers who just missed. The National League appears to have better balance amongst position players than the American League did as I can find no positions that are as downright pathetic as 1B and C were in the AL. I indicated Cervelli was a bit of a weak spot, but the best catcher in the game this year (Realmuto: and it's not really all that close) resides in the NL which, in my eyes, makes up for that. Cervelli also might be even with or a tick better than Wilson Ramos (who was my AL starting catcher) so far, and then of course there's Buster Posey. Advantage NL. Not close. Not here to discuss his off-field "contributions". That is for another forum. 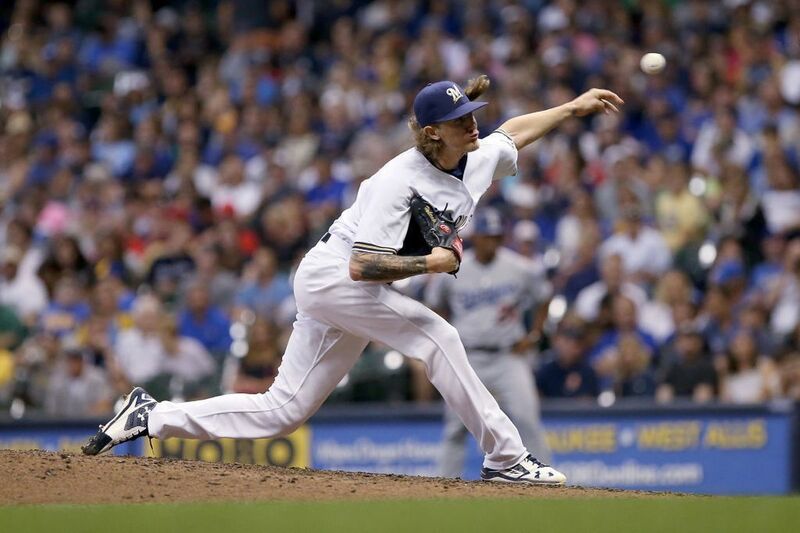 On the field, Josh Hader has been fantastic so far, and that's what we'll examine here. At the break, he was 2-0, with 7 SV, a 1.50 ERA, 1.71 FIP, and a 1.78 xFIP across 48.0 IP in 31 relief appearances. He had 16.69 K/9, 3.56 BB/9, 0.75 HR/9, and just 19 hits allowed in those 48 innings to go with 19 BB and 89 K. His WHIP was a miniscule 0.79, and he had allowed a ridiculous 3.56 H/9. Some pitcers would kill for an ERA like that, but nope that's his H/9. He does have a .231 BABIP, and an 89.5% strand rate, so there might be some regression for him in the second half, but those are video game numbers folks. If he does regress, Jeffress, Doolittle, Adam Ottavino (COL), Seranthony Dominguez (PHI), Jared Hughes (CIN), Kirby Yates (SDP), Tony Watson (SFG), and Archie Bradley (ARI) could be there to chase him down. All of them, like Hader, have either a low BABIP, a high strand rate or both which could be problematic for them down the stretch. Of all of them, Watson has the highest BABIP at .286, but has a strand rate of 85.8%, which while not as high as Hader and others is still quite high. Dominguez has the lowest strand rate at 79.7%, but his first half .208 BABIP could push him back down a bit. Felipe Vazquez (PIT - formerly Felipe Rivero) could join the race with his first half .340 BABIP and 69.8% strand rate, as well as Craig Stammen (SDP - [.346 and 73.3%]) as both of them had a high BABIP and a low strand rate at the break. Should be interesting heading into the most important games of the year. Quick, how many of you had Brian Anderson in your NL ROY pool (if there is such a thing)? Yet here he is through the first half leading the way. In the first half he slashed .288/.363/.429 with 8 HR, 49 RBI, 55 R, a .345 wOBA, and a 119 wRC+. On his way up to the majors, he was a 3B, but this year has been shifted to RF, and has played there about twice as much as 3B. 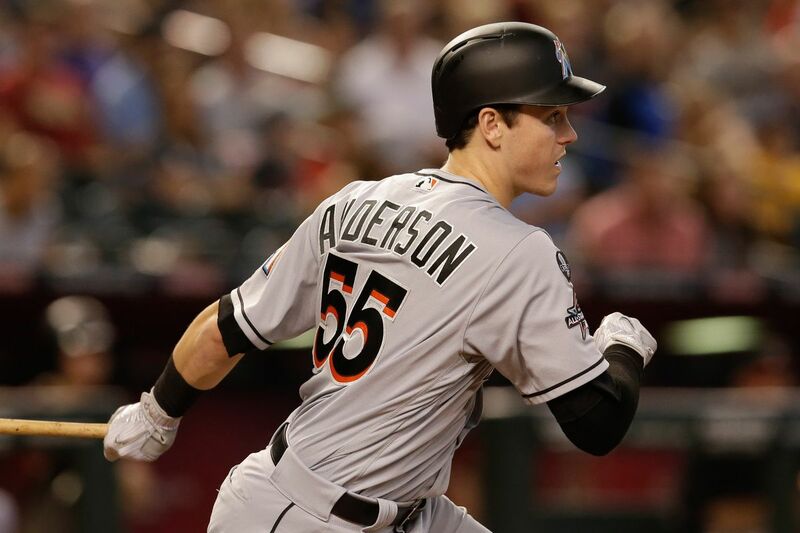 He has excelled in RF defensively, so one wonders if the Marlins will leave well enough alone and let him stay there. Why fix something that's not broken? This solid defense has put him at the head of the class IMHO. RP Seranthony Dominguez has been sensational so far for the Phillies. He is a groundball machine (53.4%), who also strikes out a lot of hitters (11.5 K/9), and does not walk them (1.6 BB/9). That is a deadly combination in the late innings not only for this year, but into the future (as always if he can stay healthy). He put up a 1.60 ERA, 1.69 FIP, and a 2.37 xFIP in the first half going 1-2 with 9 saves. The warnings on him are a .208 BABIP, and a 4.5% HR/FB rate, so we'll see how he holds up. I don't think RP Yoshihisa Hirano is going to last on this list. His context neutral stats (0.4 fWAR, and 0.9 bWAR) indicate that to me, but he has a very good WPA of 2.73, and a very good REW of 1.45 (relievers tend to have a lower REW due to less volume than starters, but tend to have a high WPA due to the fact that they tend to enter the game [if they're good] in high leverage situations), so the context dependent numbers look good. He's probably due to regress, although his BABIP (.257) is not as low as some of the relievers we examined in the Trevor Hoffman Award section. His strand rate (79.0%) also isn't as high as some of the guys we looked at. His HR/FB rate is a pretty normalish 8.8%. He had a 2.20 ERA, 3.46 FIP, and a 3.86 xFIP across 41.0 IP in the first half. Maybe he can fend off the regression monsters, but I doubt he can fend off OF Juan "Childish Bambino" Soto of the Washington Nationals. As just mentioned, the 19-year old Soto is charging hard and may be tops on this list when all is said and done. Offense is not what's holding this guy back for me. A .301/.411/.517 slash line, a .399 wOBA, and a 151 wRC+ suggest he's gonna do just fine with the bat. It's his defense that needs some work. But he is only 19. OF Jesse Winker (CIN), RP Reyes Moronta (SFG), OF Harrison Bader (STL), RP A.J. Minter (ATL), RP Victor Arano (PHI), and RP Jesse Biddle (ATL) are other guys to watch. Hopefully OF Ronald Acuna (ATL) can crank it up in the second half as well. I can hear the gasps of the traditional minded talking heads now if they were to see this list. I can visualize their heads exploding. "How in the world can you select a guy with 5 winzzz who plays for a last place team for the Cy Young Award? Have you lost your mind?" That's what they will focus on if Jacob deGrom is able to bag the trophy come the end of the year with a (possibly) single digit W total. Their obsession with his win total will be blinding them to the question that they should be asking: How on God's green earth did he only lose 4 games (so far)? That's one question that never comes up in these debates. 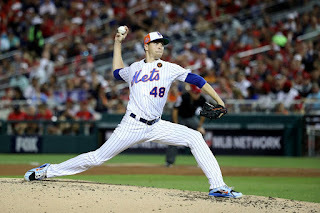 What they also fail to look at is the fact that in the first half deGrom was in the bottom 10% of all MLB pitchers in defensive support (as per bWAR's RA9def component), and in the bottom 20% of all MLB starting pitchers in offensive support. If there is something he can do beyond suing his teammates for lack of support, he should do it. This is not a good combination to have in order to have success with his win/loss totals. Goodness knows how many wins he'd have by now if he was on a team with any level of competence whatsoever, but hey it's the Mets. What can you do? He is 5-4 with 10 no-decisions, despite a 1.68 ERA, 2.32 FIP, and a 2.73 xFIP across 123.1 IP. That ERA leads the major leagues among qualified pitchers, as does his ERA+ of 227. 227! That FIP also leads the National League and is 3rd behind Chris Sale (2.17), and Trevor Bauer (2.23) among qualified pitchers in all of the major leagues of baseball. He has made 19 starts and allowed 26 runs. Not earned runs...Runs. He is having an historic season that may go by the wayside because of a stat which probably stopped having any significance once bullpens became a feature on major league teams, and not a place where broken down pitchers went to die. I would contend that pitcher wins have never had any significance at all. It's just taken us this long to figure it out (and some of us still haven't). deGrom is definitely one of the poster children for MLB Network's Brian Kenny's #KillTheWin crusade. Wanna know some others? In 1905, Cy Young himself was 18-19 with a 1.82 ERA over 320 IP. In 1926, Lefty Grove was 13-13 with a 2.51 ERA over 258 IP. He made 33 starts and completed 20 of them. In 1952, Warren Spahn was 14-19 with a 2.98 ERA, five shutouts and was the NL leader in strikeouts. In 1989 Orel Hershiser was coming off his crazy great 1988 Cy Young season that featured a 59-consecutive-scoreless-inning streak and a 23-8 record. In 1989 he crashed to a 15-15 record. But did he really crash, or did some meaningless stat get in the way of us seeing the truth? 1988: 23-8, 267 IP, 2.26 ERA, 149 ERA+, 3.18 FIP, 1989: 15-15, 256.2 IP, 2.31 ERA, 149 ERA+, 2.77 FIP. According to every number here (except wins and losses), he was as good or better in 1989 as he was in 1988. Here's probably the best example of them all: 1987 Nolan Ryan. 211 IP, 2.76 ERA, led NL in ERA+, FIP, and K (270). Wanna know what his record was? : 8-16! How does that happen? Easy. Repeat after me: a pitcher's win/loss record in a season does not have any correlation whatsoever with his quality of pitching during that season. Period. End of story. The other two examples are 1996 Roger Clemens, and 2009, 2010 Clayton Kershaw. Are you seeing the trend that I'm seeing? All of these guys except Clemens (PED associations), Kershaw (still active, but well on his way), and Hershiser (a borderline candidate who fell off the ballot after 2 years, but should probably have been given further consideration) are in Cooperstown. Even the all-time greats can have great seasons that feature crappy win/loss records. Next time you're looking at a pitcher's stats, do yourself a favour...Bypass that W column and the L column (and the SV column while you're at it, but that's for another day) altogether. Do not look at them. They are meaningless. Am I saying deGrom is a HoFer? Nope. He probably doesn't stand a chance because he didn't reach the big leagues until age 26. But he is having a HoF type season, and you'll miss it altogether if you get stuck on wins and losses. The stats in the previous paragraph were lifted from Brian Kenny's excellent book "Ahead of the Curve: Inside the Baseball Revolution". Read it if you're interested in baseball stats, and read it even if you just love baseball and want to understand these new-fangled alphabet soup stats that tell you much more about player performance than the baseball card stats ever could. Rant over. Now where was I? Ah yes, the 2018 first half Cy Young Award. The way I see it, this race goes deGrom (space), Nola (space), Scherzer (Grand Canyon), Stripling and Freeland (space), the rest. Nola and Scherzer are having outstanding seasons, and could challenge deGrom in my version of this award. The rest of them are gonna have to hope for a deGrom injury, which would be a shame because again this is an historical season we are witnessing (so far). Nola and Scherzer were very good in their own right in the first half, but unlike deGrom, their teams were rewarding them with wins. Nola went 12-3, Scherzer went 12-5. Nola had a 2.30 ERA, 2.60 FIP, and a 3.21 xFIP across 129 IP, while Scherzer had a 2.41 ERA, 2.80 FIP, and a 3.14 xFIP across 134.2 IP. They all struck out more than a batter per inning (deGrom: 10.87 K/9, Nola: 9.14 K/9, Scherzer: 12.16 K/9). All of them had BB/9 rates of under 2.50 (deGrom: 2.19, Nola: 2.44, Scherzer: 2.27). deGrom and Nola had very good HR/9 rates, while Scherzer's was OK (deGrom: 0.51, Nola: 0.42, Scherzer: 1.00). These three are having great seasons. Barring injury/some kind of a miracle second half by another pitcher, one of them should win the 2018 NL Cy Young Award. 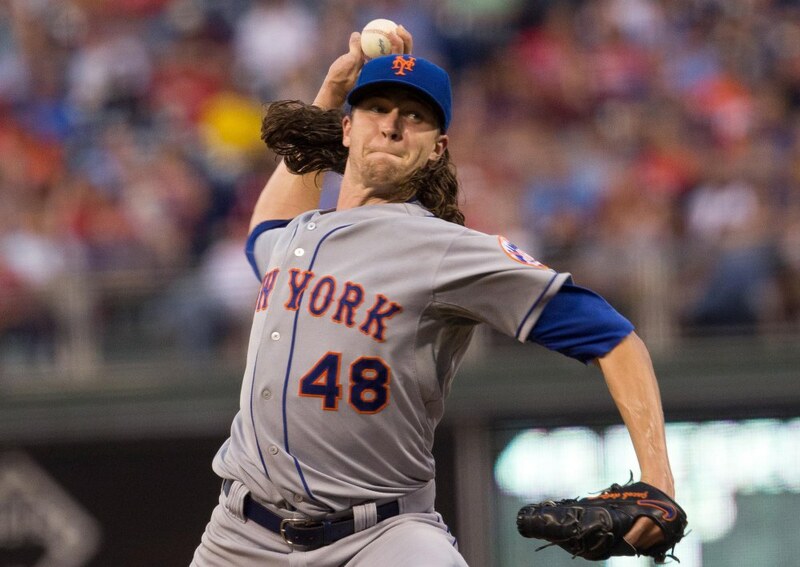 The above deGrom pic is for mk, and all the rest of you who like/envy the long flowing locks. Given how superstitious ballplayers are, you'll probably never see them on him again, so check 'em out while you still can. Yes, I selected a pitcher with a 5-4 record on a last place team for the CYA and the MVP. That should tell you how crazy dominant he's been. The fact that Nola and Scherzer are within spitting distance in both races is a tribute to them and the seasons that they are having, but deGrom is above them in both races for me. It's much closer on the MVP side of things though, as once you factor in batting and defense along with the pitching, things tighten up a lot. It's not quite a Grand Canyon between Nola and Freeman, but it's still quite the gulf. Some of you will be uncomfortable seeing three pitchers at the top of the MVP rankings. I kind of am too. After all, they have their own award. Often times when I hear real life voters talk about pitchers and the MVP, they'll say something like: "I will only give it to a pitcher when a pitcher is truly head and shoulders above the position player field. It has to be a season of true dominance." In this case, I don't see any seasons that are more dominant by position players in the NL (yet - that may change), so I have no qualms whatsoever about putting the big three up top as they are all having phenomenal seasons right now. Remember that in the AL there were three dominant hitters who were absolutely crushing it up until the break. Betts, Trout, and Ramirez hammered the field. It's the same thing here, only it's three pitchers. I've got Freeman and Suarez really close together. There's a little dropoff to Goldschmidt. Then another little dropoff to Baez, who is basically indistinguishable from Cain and Arenado, and then another little dropoff to Realmuto, who's very closely bunched with Zack Greinke, Scooter Gennett, Matt Carpenter, Ross Stripling, Max Muncy, Jesus Aguilar, and Ozzie Albies but manages to take that final spot in the top ten. Greinke is a really interesting case. He just missed the All-Star team as a pitcher being barely beaten out by Tyler Anderson, but when you add in his hitting and defense (as I do when I look at the MVP), he zooms up to number 11 in my MVP race. He was slashing .270/.325/.351 at the break, good for a .300 wOBA, which is good for an 85 wRC+, all of which is kind of awesome for a pitcher. He also fields his position very well, which helps him out a little more. Those of you wondering what Lorenzo Cain is doing on this list, as he only has 27 RBI need to look a little deeper. He has 18 SB, a .393 OBP, a .362 wOBA, a 125 wRC+, and is an excellent baserunner, and defender at a premium position (CF). He is one of those players who doesn't necessarily stand out in any one area, but is an excellent all around player, and seems to be above average wherever you look, except maybe in the power department, but that .393 OBP is enough to make up for that. As for the age breakdown, this is a bit of an older group than the AL group. There are only two guys aged 25 or younger, and they're both 25 (Baez and Nola). deGrom (30), Scherzer (33), Cain (32), and Goldschmidt (30) are all 30+. This leaves Freeman (who astonishingly is only 28), Realmuto (27), Arenado (27), and Suarez (26). Even though they're a bit older than the AL MVP candidates, there are still a lot of guys in their prime, and the guys who aren't (Scherzer and Cain) appear to be aging quite well thank you very much. Thanks muchly for reading. See y'all in the comments.